As per statistics, almost 200,000 people move from small town into the city each day; And the number is increasing. And a vast majority of people still prefer to get around per car in their daily lives; likely to be same for many more years. However, parking is still a major concern into the overall travel chain hence it becomes imperative to include it as part of integrated mobility offers thereby enabling end user to switch to other modes of transportation – such as public transport or ride share. Our goal at PParkE is to make the parking experience easy, accessible as much as possible. 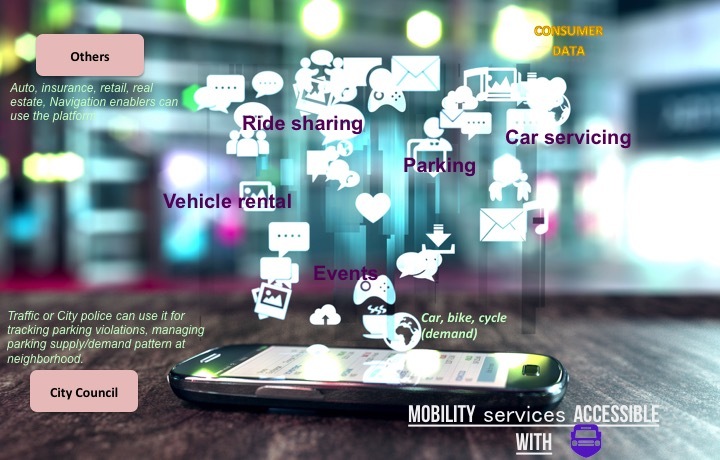 In order to adapt the service & mobility, it is essential to know the different user groups that park their vehicle, be it motorists, employees, residents or tourists. It is very likely that the car park of tomorrow will be a hub for a variety of mobility services that are accessible with App: be it local Events, car sharing, car/bicycle parking, bicycle rentals or charging of electric vehicles. The adoption of modern technologies such as mobile devices can helps to generate valuable customer data e.g. on user behaviour patterns, preferences, much more. Based on profound insights, service providers can personalise their offerings and engage with the user interactively in this way. For the user, mobile devices can serve as a medium to access real-time information, and pay for services. This in turn facilitates user-specific loyalty services and better customer life cycle value. This could further enhanced with “points systems” to be spent for any of the mobility services packages. City councils or authorities can use it for tracking parking violations, managing parking supply/demand pattern, manage enforcement activities at neighbourhood level . PParke would like to incorporate solutions and integration of mobility services and partners in this network. Service providers are being given a tool to enrol integrated parking & mobility services across various B2B and B2C channels and to use the full potential of the car park as a marketing platform.